When the Chan Centre was in its earliest planning stages, people initially assumed the site would be cleared to make way for the new building and open up sweeping views to Howe Sound. Architect Bing Thom, however, had a different vision: to design the building around the trees. 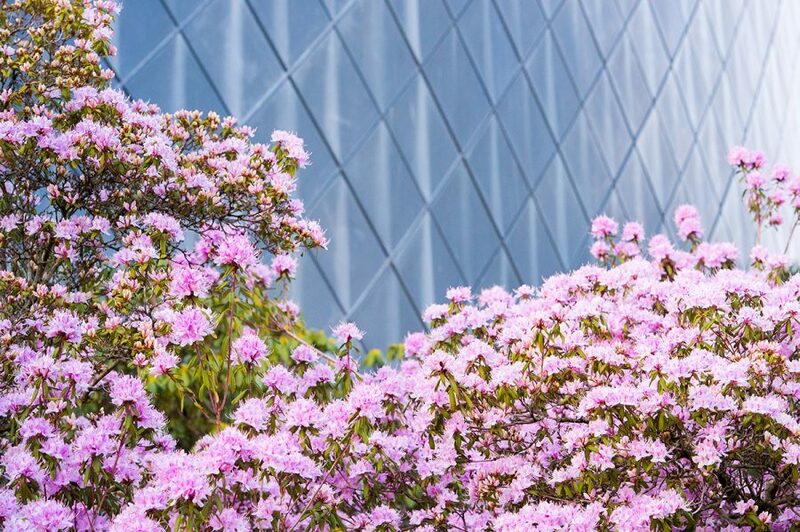 The picturesque site featured more than 50 towering coniferous trees that were planted as an experiment by UBC forestry professors in the early 20th century, as well as more than 200 mature rhododendrons and azaleas, many of them over 60 years old. Thom worked with legendary landscape architect Cornelia Oberlander to achieve two key ends. First, because many of the trees were more than 100 feet tall, nestling the Chan Centre within them would make the eight-storey building more discreet and less imposing. Second, it would also give visitors views to the trees and the lush plantings, whether they were there in the daytime or at night, in winter or summer. The azaleas and rhododendrons were moved offsite to the university nursery for safe storage, while the trees were carefully protected during excavation. Miraculously, not a single mature tree was cut down during the building process. Now that forest, which was named the Dorothy Somerset Grove after the inspiring founder of the UBC Department of Theatre, is one of the building’s most beloved and talked-about features, and the view from the lobby continues to make jaws drop. The centre also neighbours the spectacular UBC Rose Garden, and is moments away from the winding trails of Pacific Spirit Regional Park and the rocky shores of Tower Beach.